You can now purchase activities for the FIVE Caldecott Books together in one download! Trixie carries Knuffle Bunny with her everywhere! Disaster hits on a trip to the washateria when Knuffle Bunny disappears! What's a toddler to do? You won't be surprised to see that this toddler does what she has to do! A Kids' Wings Favorite! 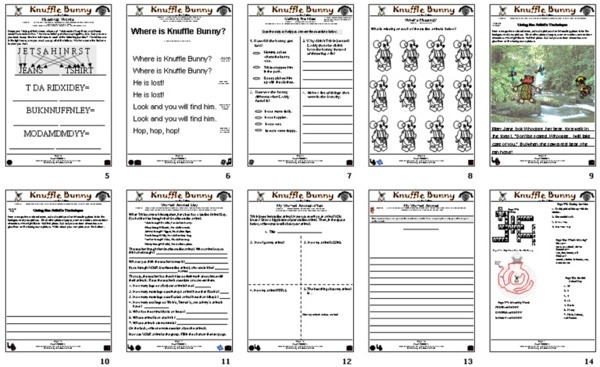 The Kids Wings Unit for Knuffle Bunny: A Cautionary Tale is part of a collection of 39 units in Book Buddies for 2005. It contains 472 pages of activities that we guarantee you will LOVE because YOUR KIDS WILL LOVE THEM!